Spectacles, eyeglasses or simply glasses are made from glass or hard plastic lenses. The lenses are kept in place via a frame. The lenses are held in front of the wearer's eyes, using arms that go over the ears and a bridge that goes over the nose. Glasses are used to correct specific vision problems. For example, reading glasses and glasses can be used to correct nearsightedness. If you struggle seeing what you read, then reading glasses can help. Safety eyeglasses protects the eyes from flying debris. These types of glasses are designed for lab technicians, construction workers and others who work in industries in which debris is common. Safety glasses are sometimes designed to protect the sides of the eyes and the lenses themselves. There are also glasses that protect from radiation, near-visible light and things of that nature. Players in some sports wear protective glasses. Squash is one of those sports. They are worn to protect the eyes from becoming injured. Glasses for sports often are equipped with straps, which are designed to prevent them from falling off. Glasses may be attached to a cord. The wearer will keep the cord around their neck. This is so they do not lose the glasses. Sunglasses allow a person to see better in bright daylight and the lenses protect the eyes against UV light. Most sunglasses are darkened and there are specialized glasses that are clear when there is no light, but darken when exposed to light. However, most sunglasses do not correct vision problems, but there are prescription sunglasses that are specifically designed to correct vision problems. There are specialized glasses that can be used for viewing visual content. For example, if you want to watch a 3D film, then you can wear a pair of 3D glasses. Eyeglasses come in a range of styles, and many people wear glasses for fashion purposes. Popular materials used to make glasses include wire and plastic. The older people get, the higher the chances are of needing glasses. In fact, more than half of adults between 65-75 were glasses or will need glasses at some point. As you can see, eyeglasses are important and people wear them for many reasons. When your vision isn’t what you need it to be, life can be well, difficult. We know that, and we get that. There’s a reason you are on this page right now and believe us it is not by accident. Regardless of how you ended up here, we’d like you to keep reading because we think you have FINALLY found your eye doctor. There are a couple of things that come up when we see new patients. Sometimes, it’s just not a good fit. And just like the perfect pair of glasses, if they just don’t fit right on your face, you need to scrunch your nose, wiggle your face or may even get some tension headaches from the uncomfortable fit. We want you to know that we’ll do our absolute best to make sure it’s a good fit – financially and otherwise. We work one-on-one with our patients. When you become a patient of ours, you become a part of our family – plain and simple. We’ve been around for quite some time and have a track record to prove why you should choose us. However, this is about you not about us. Some of the problems that we see arising in the eye care industry are things like long wait times for an appointment, discomfort with the service provider and high costs. Here at Fifty Dollar Eye Guy, we don’t just choose any optometrist that walks through the door. We have a very selective process as we know that our business, our livelihood and our reputation hinges on the type of service that we provide. We select our Doctors and Eye Care Professionals through many other requirements besides what shows up on a resume. Experience – Okay, so SOME of the resumes counts, we won’t deny that. We want to be sure that anyone that works for us has the kind of professional experience that we require. Professional Demeanor – Your interactions with our eye care professionals is of the utmost importance. We want our staff to ensure that you are getting THE top quality service you deserve each and every time you come to one of our locations. Dedication To Personalized Care – In this fast moving world that we live in, all too often service providers are trying to get patients in and out the door. Other businesses with this mentality work well for us because we do just the opposite. We want you to know that we are dedicated to one-on-one care. From the minute you walk into the office, we want you to feel the comfort level and professionalism. Appointment Scheduling – We know just how difficult it can be to get an appointment, so we will do our best to accommodate your busy schedule. We won’t fit you in where we can. We will do our very best to work around your schedule. Financial Alternatives – This is usually one of the biggest concerns that we have with new clients. Rest assured, we not only understand the process of insurance coverage, but it’s one of the reasons that we get new clients. Our staff at Fifty Dollar Eye Guy will work with you personally to help you better understand the current vision coverage that you have from your insurance provider. Our staff will also help you to find financial alternatives so you can get the best care possible. No Dilation Procedures – Wait, what? Yeah, you read correctly. 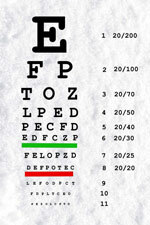 Eye dilation is crucial in many eye exams. If they are crucial, then what’s the big deal? The big deal is they can be extremely uncomfortable. Here at Fifty Dollar Eye Guy we have no-dilation pain free Optomap exam technology. See, we promised you comfort. Let’s see what some of our other patients have said. We aren’t just an eyeglass shop. We do so much more than that. If you have any kind of vision concerns, then we can offer you the services you need to get them corrected as soon as possible. These are anything but routine. While they are done on a regular basis, they help us as well as you, to see (no pun intended) if there are any improvements or corrections that need to be done to your vision. We run a series of tests, we assess all the movements of your eyes and do an overall evaluation of your eye health. By doing such a round-up of exams and tests, we can ensure that your vision is optimal at all times. Are you looking for an alternative to glasses? If this is your first time in getting contact lenses, we can give you a wide variety of options when it comes to your lenses such as daily-wear soft to extended-wear disposable. There’s a lot to take into consideration when you are thinking about contact lenses, which is why you’ll want our knowledgeable staff on your side to answer any and all of your contact lens questions. Thinking about Lasik surgery? Here at Fifty Dollar Eye guy, we can help to ensure that your Lasik surgery goes as smoothly as possible by offering you pre and post-operative exams. If you are in the market for a new pair of eyeglasses or sunglasses, then look no further than your specialists here at Fifty Dollar Eye Guy. We can fit you with a comfortable pair of eyeglasses or sunglasses to fill all of your visual needs. We’ll also work with you to find the best financial alternatives to pay for your new pair of glasses. If you have been experiencing any concerns with your vision, or if you just need a new eyeglass guy in Pensacola, please give us a try. Not only will you find our offices to be pleasant, give you the personal attention you need and give you the financial alternatives that you’ll want, but you’ll also find us as the preferred eyeglass specialist in the Pensacola area. We’ve got several locations that can serve you, but if you are ready to get started and are in the Pensacola Area, please give us a call at 8Fifty-434-6388 today. Your vision isn’t something that you can mess around with. If it isn’t attended to quickly, you could find yourself in some hazardous situations. If you are ready to get started please contact one of our friendly staff today by calling 850-434-6388. Our one-on-one approach to eye care makes us the eye and vision care providers of choice in the Pensacola area. Our independent doctors of optometry offer the following services: complete eye exams, contact lenses, glasses, glaucoma testing, and pre- and post-operative care. For a complete list of services, visit our services page or call our Davis Highway office at 850-434-6387 or our Pensacola Blvd office at 850-434-6388. At 50 Dollar Eye Guy, we are dedicated to providing high-quality eyecare services in a comfortable environment. Call us at (850) 434-6387 Davis Highway or 850-434-6388 Pensacola Blvd schedule an appointment today online. FREE EYE EXAM with purchase of complete pair of glasses. Or bring you DR's RX and receive $59 OFF your eyeglass purchase! Sign-up using the form or call us at 850-434-6387 to take advantage of this exclusive offer. Only at 5328 North Davis location.